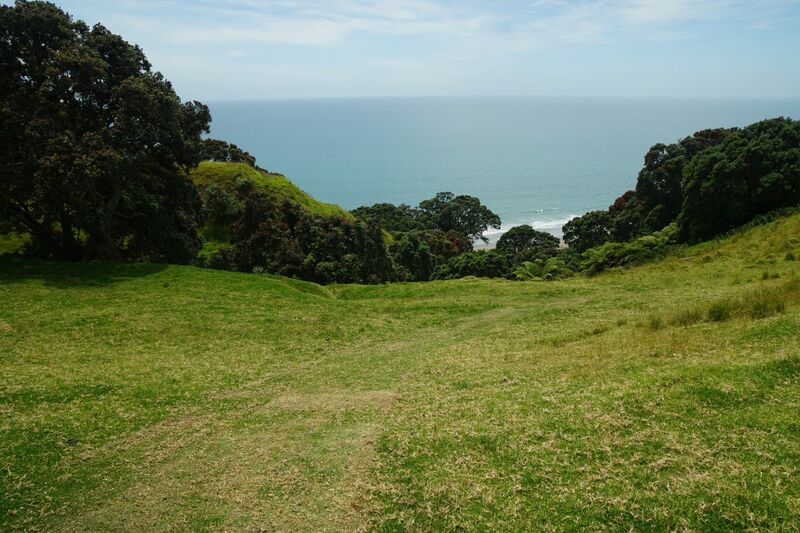 The tracks are mostly very easy, with only a few steps and a few steeper areas. However, the signage could be improved in a few places to avoid any confusion. Part of the walk passes through farmland, and less than half is under tree cover. 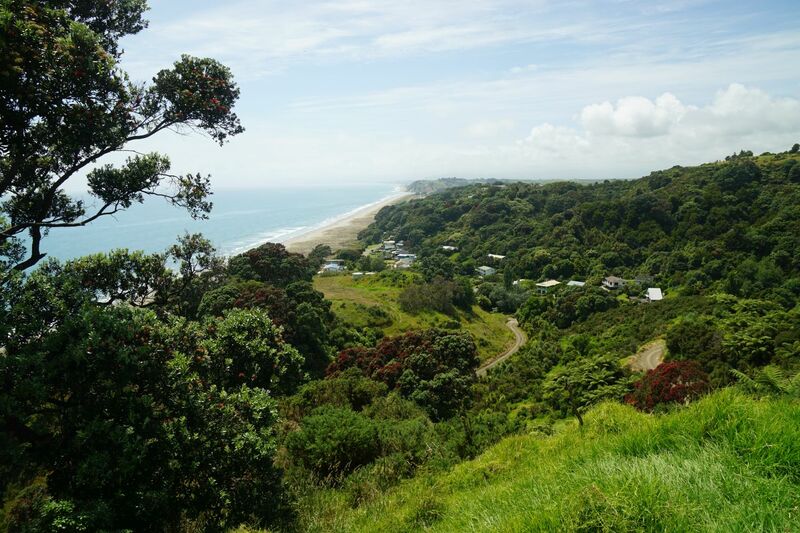 Total distance walked was 7 km, including access to the beaches at each side of the headland, and the short side track to an area with glowworms. This took a total of 2 hours. The entrance to the park on Bryans Road. There is a small parking area on the right hand side of the gravel area. Entry to the park is through a small gate to the left of the large wooden gate. 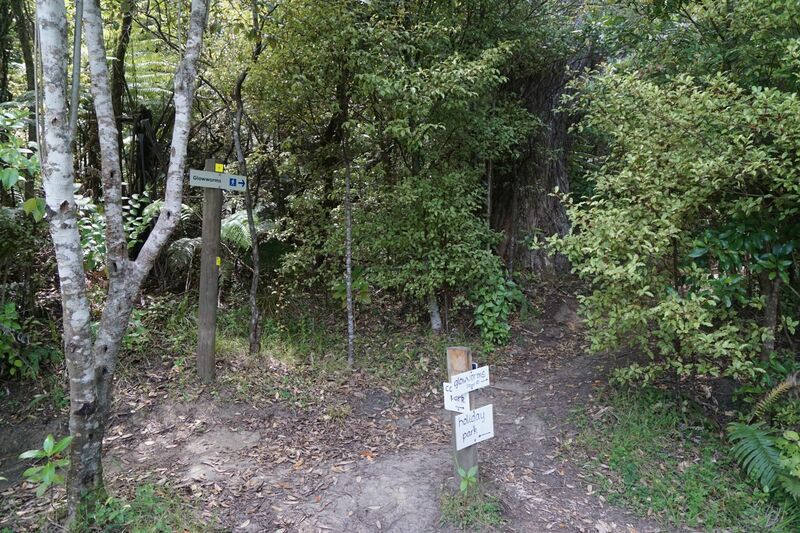 Dogs on a leash are permitted, but mountain bikes and horse riders are not allowed access. The information panel by the wooden gate at the entrance to the park. 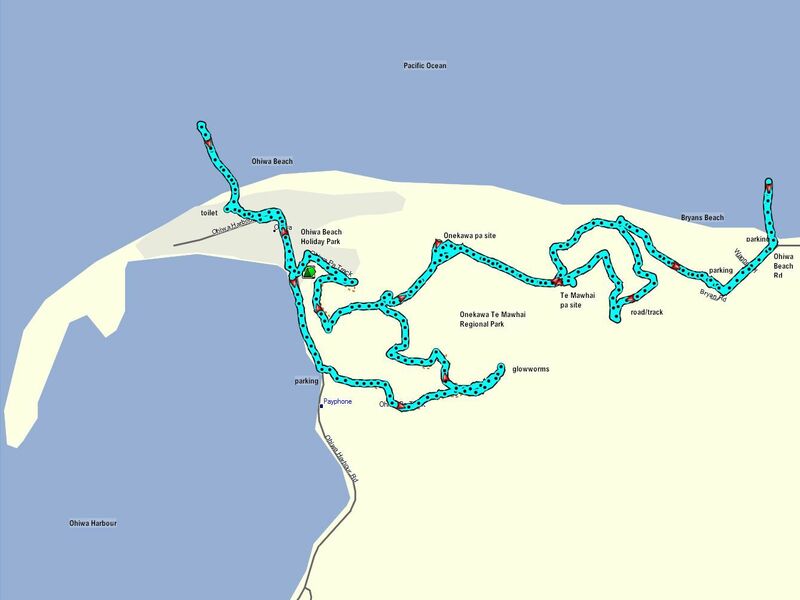 The complete circuit, using the beach for the return walk, is estimated at 1.5 hours. 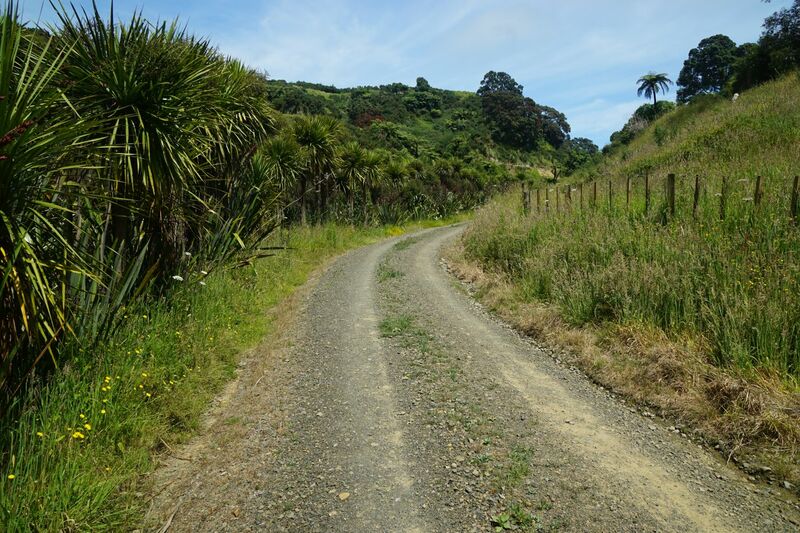 The first part of the walk is on a gravel farm track, which is still used for vehicle access to the farm and residences by the pa sites. The farm vehicle track continues to the left, and the direct walking track to the pa sites is through the steel gate on the right. Either route can be taken to reach the pa sites, with the vehicle track being a gentler gradient. On this walk the vehicle track was taken on the uphill walk, and the direct track on the return walk. 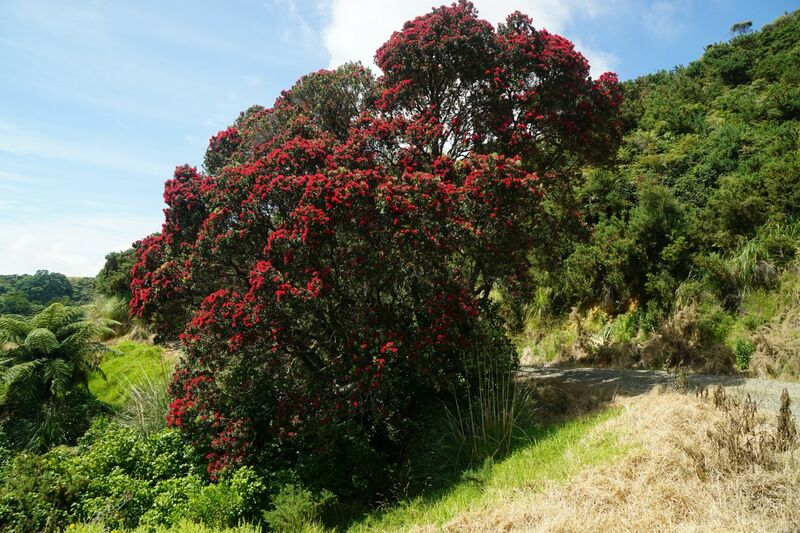 Some of the pohutukawa were still in bloom. This one next to the vehicle track. 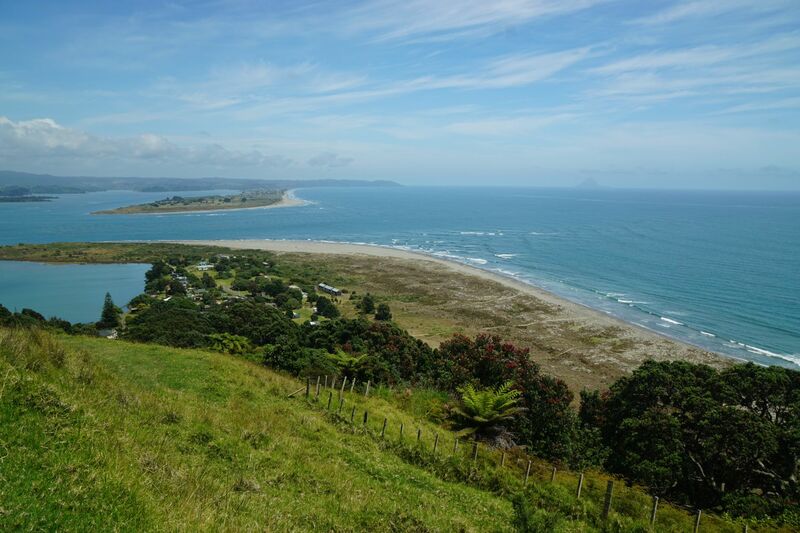 Looking towards Waiotahi and Opotiki from the vehicle track. Looking from Te Mawhai pa site towards Onekawa pa site. The vehicle track follows the fenceline on the right, the direct track up from Bryans Road ends at the middle of the 3 steel gates, and the track to Onekawa pa site is between the double fence line on the far left. 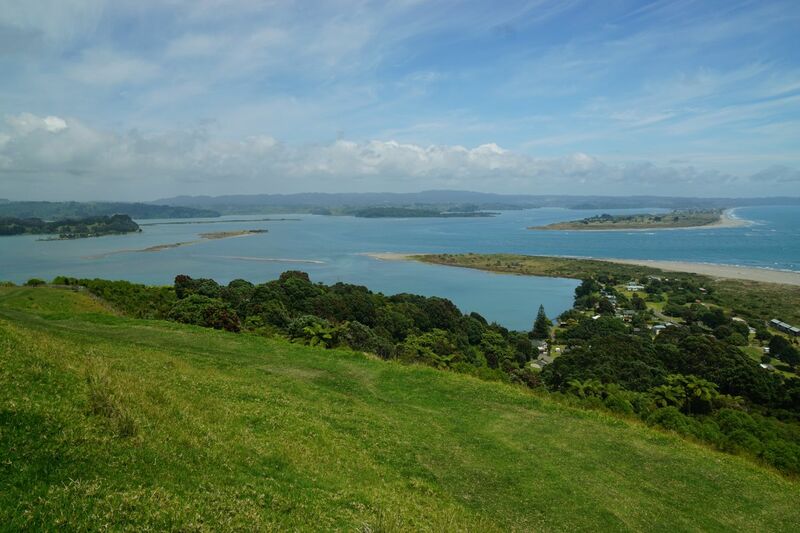 View from Onekawa pa site across Ohiwa Spit and the Ohiwa Harbour entrance towards Ohope and Kohi Point. Moutohora/Whale Island can be seen on the right. 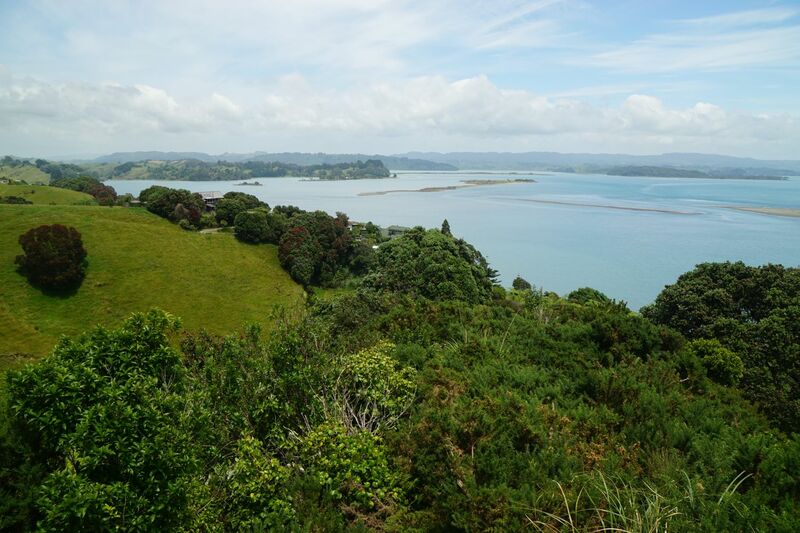 Ohiwa Harbour, seen from Onekawa pa site, with the harbour entrance on the right. 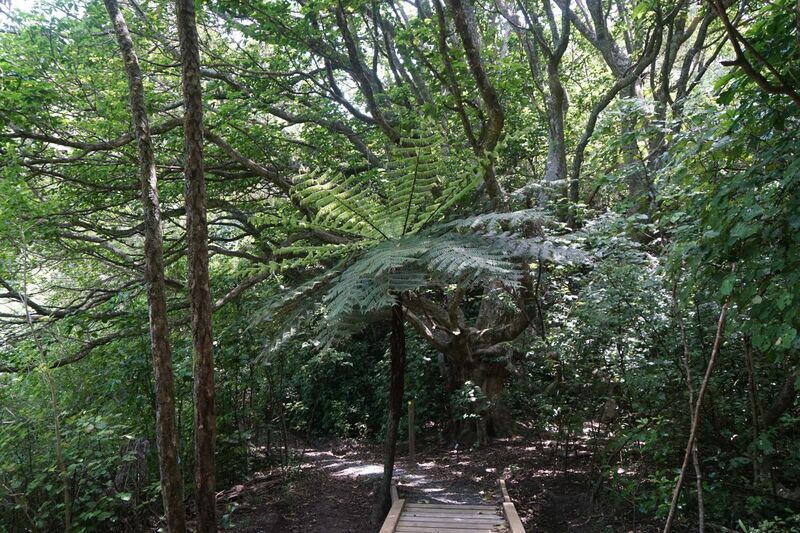 Heading towards Ohiwa from Onekawa pa site the path goes through a wooden gate into regenerating native bush. Many of the plants are marked with small information panels. 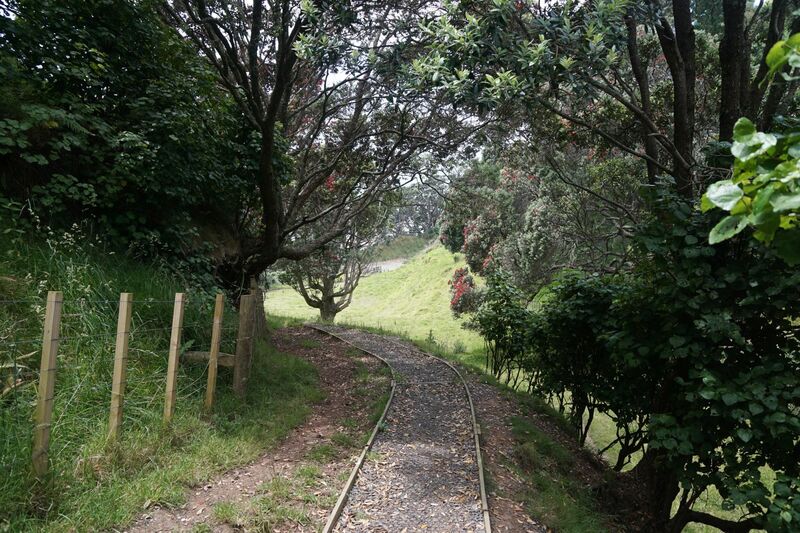 The track continues past a junction where the track to the left is unmarked, and the track off to the upper right is shown as Ohiwa Domain Walkway towards Ohiwa Spit. 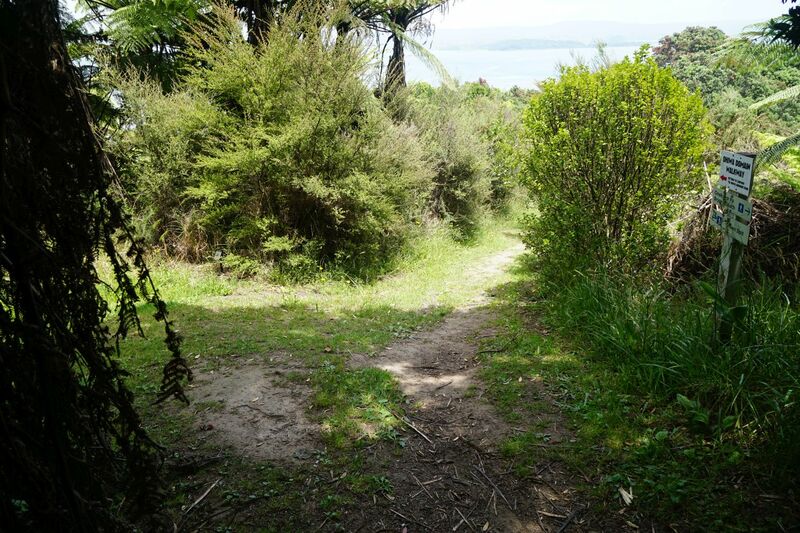 The track to the left actually continues past a side track to a glowworm area, and down to the carpark on Ohiwa Harbour Road. 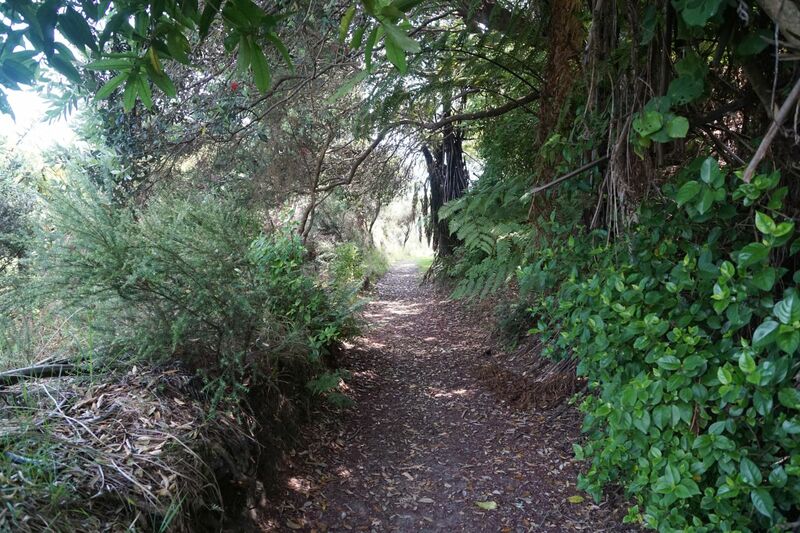 The right hand track continues on a fairly direct route down through native bush. 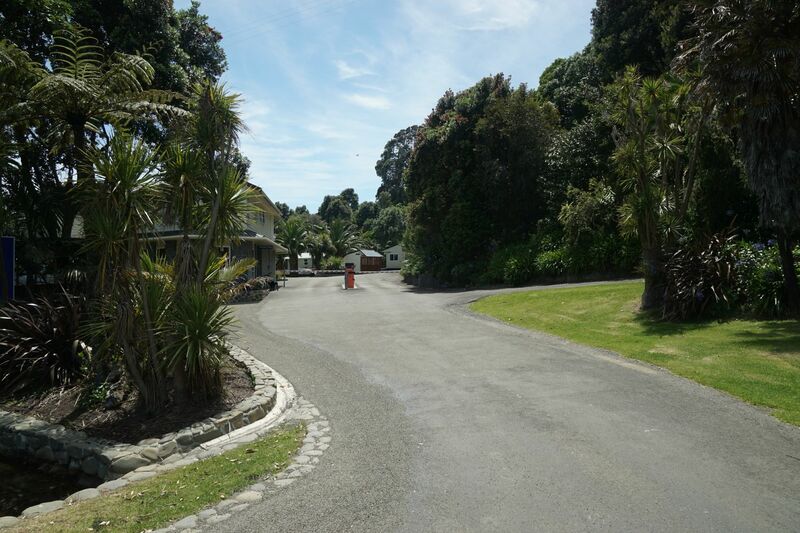 The track ends within the Ohiwa Beach Holiday Park, on the far side and to the right of the vehicle barrier arms, by the buildings at the centre of the picture. Heading towards the beach on Ohiwa Harbour Road there is a parking area, rest area, toilet, and information panel similar to the one at Bryans Road. 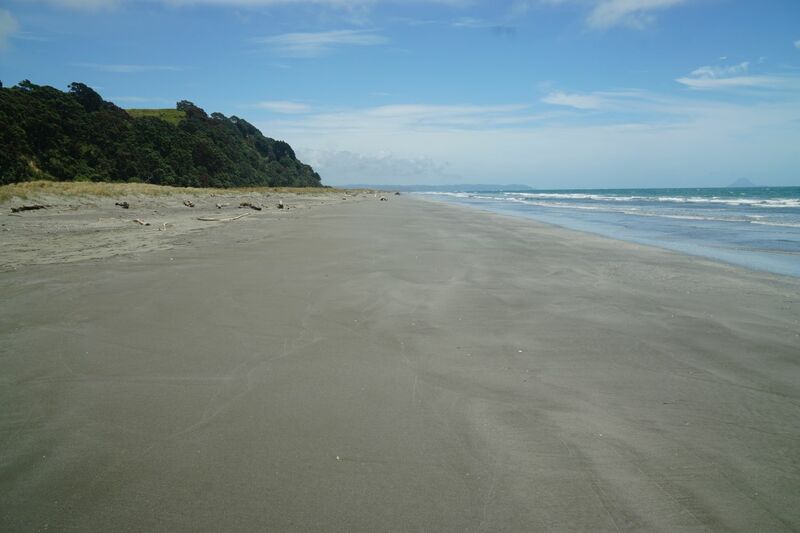 A track leads through the sandy area to the beach. 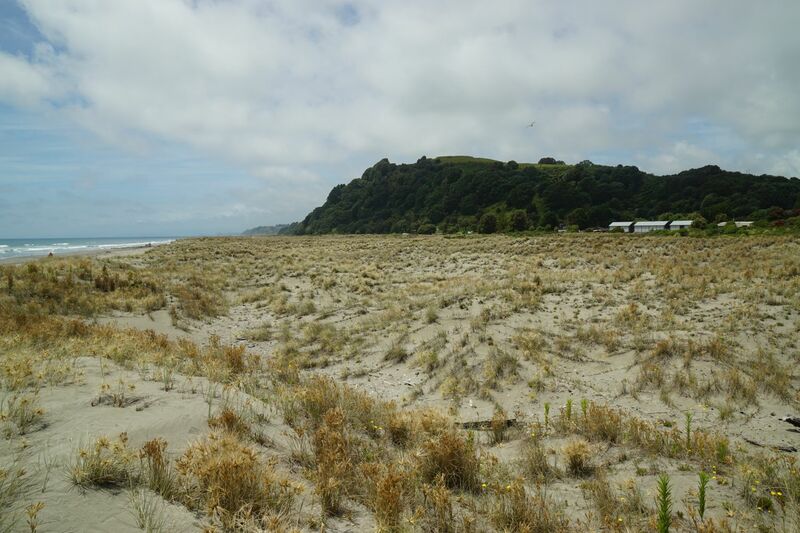 The wide sandy area, looking along the beach towards Bryans Beach and Waiotahi and Opotiki. 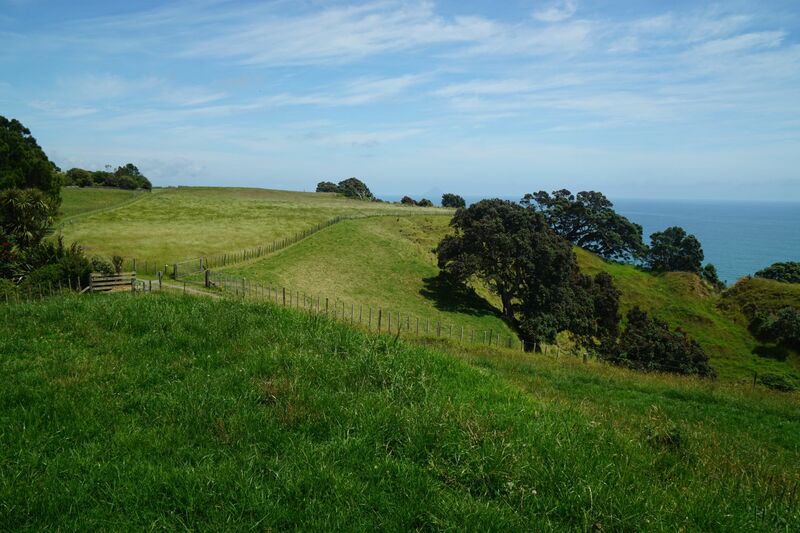 Onekawa pa site can be seen as the grass area on the highest point of the headland. 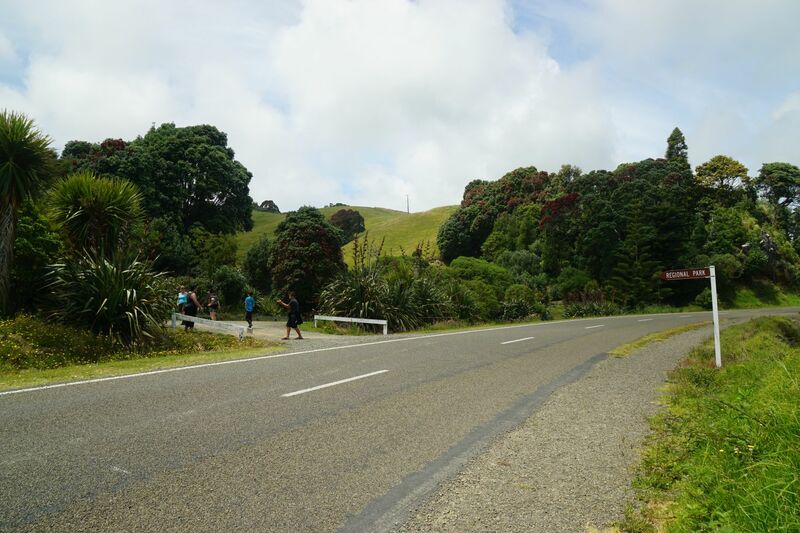 Instead of walking along the beach to Bryans Road we return to Ohiwa Harbour Road. 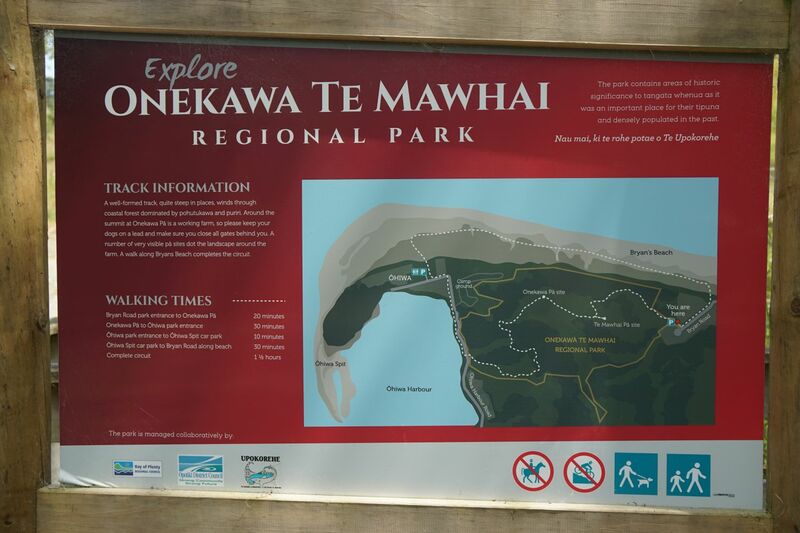 The official entry point to Onekawa Te Mawhai Regional Park from Ohiwa Harbour Road. 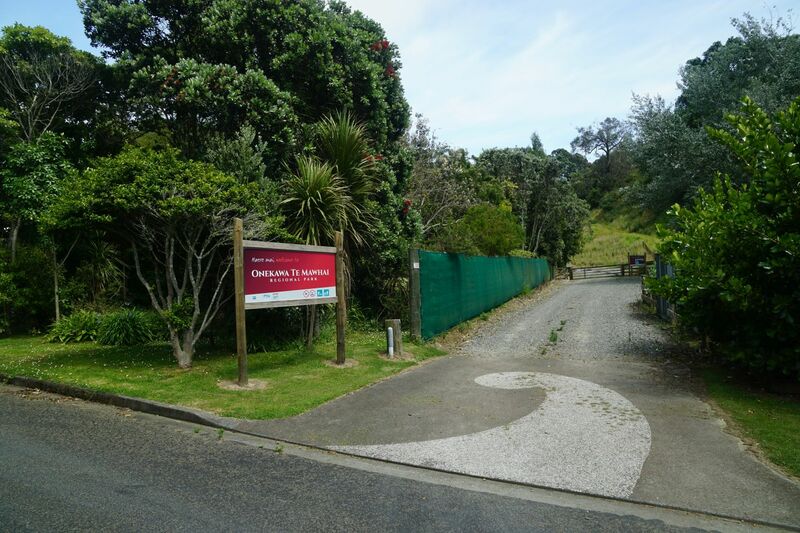 This entry is about 300 metres south along Ohiwa Harbour Road from the entrance to the Holiday Park. 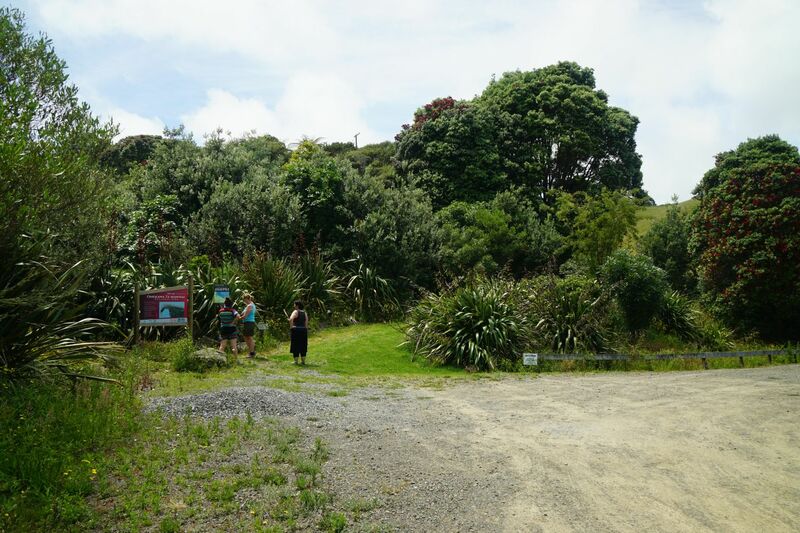 There is a small parking area on the right, and information panels about the park and walks on the left. A side track leads off at upper right to a glowworm area. The cliff face where glowworms would be visible at night. 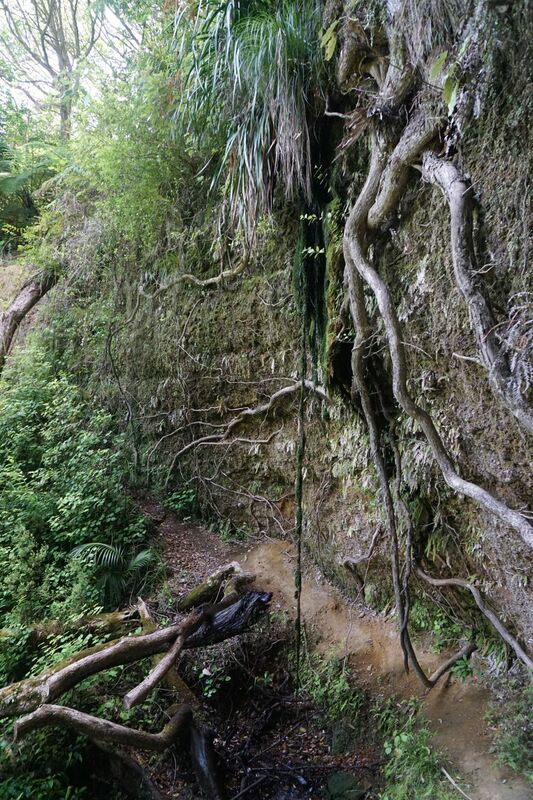 Water is slowly dripping down the hanging root, with pohutukawa roots clearly visible on the right. There is an information panel about glowworms nearby. The track has reflective markers on some of the trees so it is easier to follow at night. Small bridges have been constructed across the small streams. 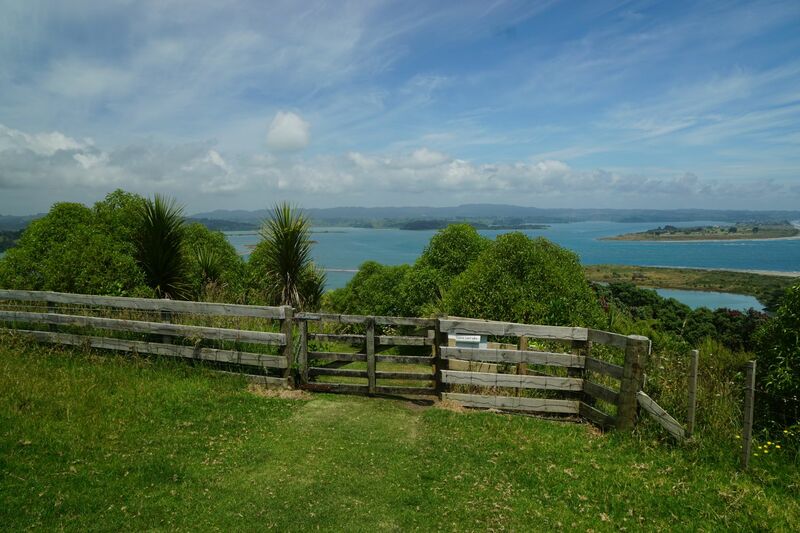 View to Ohiwa Harbour from the track heading towards the junction with the Holiday Park track and the track to the pa sites. 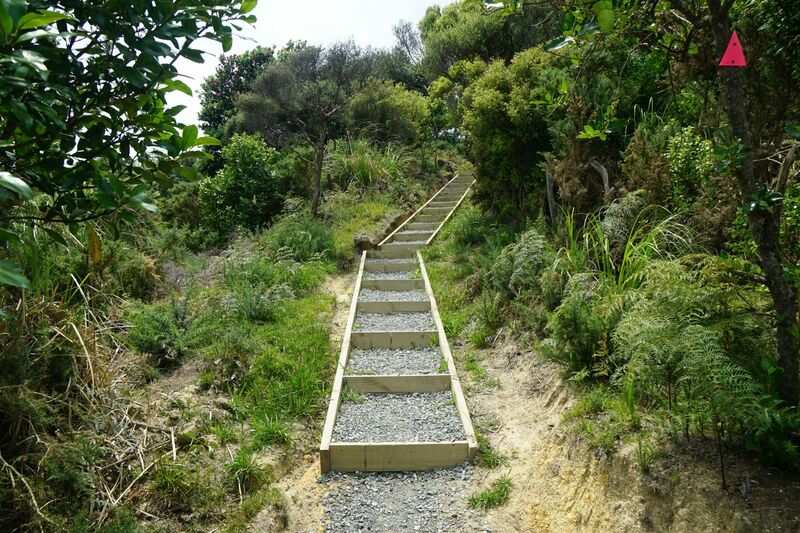 This part of the track has the only steps encountered on the walk. From Te Mawhai pa site the direct route back to Bryans Road heads down the valley on the mowed strip of grass. The track is steeper than the vehicle track, but well formed and with a plastic mat base to prevent slipping. Bryans Beach, looking towards the Ohiwa Harbour entrance. The pa sites are by the grass area on the upper left. The GPS tracklog shows the route followed. 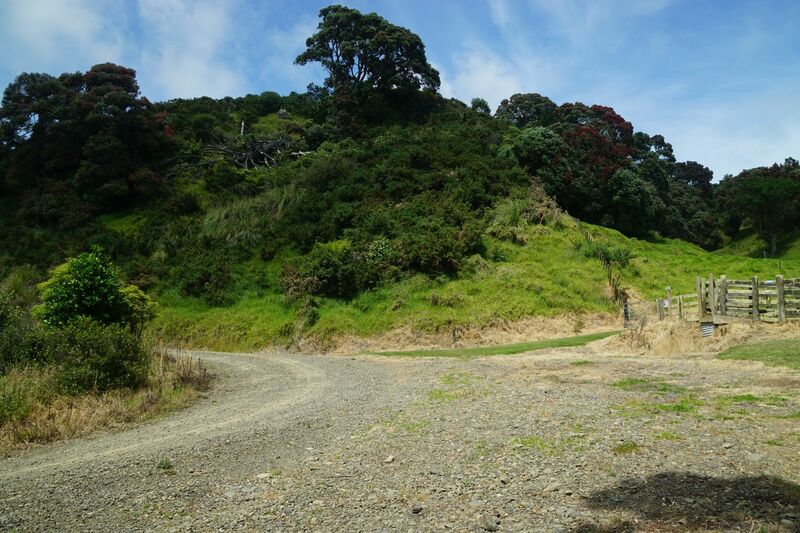 Starting at Bryans Road on the right it follows the road/track route to Te Mawhai pa site, then along past Onekawa pa site, and the track leading down to Ohiwa Beach Holiday Park, and further on down to the beach. Despite appearances on the map it does not continue into the Pacific Ocean. 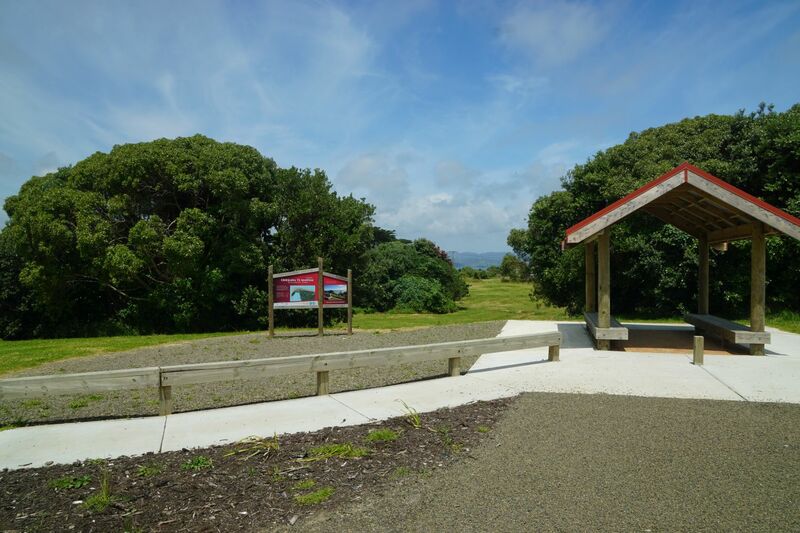 Then returning along Ohiwa Beach Road to the parking area and park entrance, up to the glowworms, and on to the junction and up to the pa sites before taking the direct track down to Bryans Road and on down to the beach. Ohiwa Harbour Rd to Bryans Rd via direct downhill, and glowworms: 2.4 km, 45 minutes. Glowworm side track: 300 m, 7 minutes (both ways). The aerial image, from Google Maps, shows a larger area than that shown on the GPS tracklog. 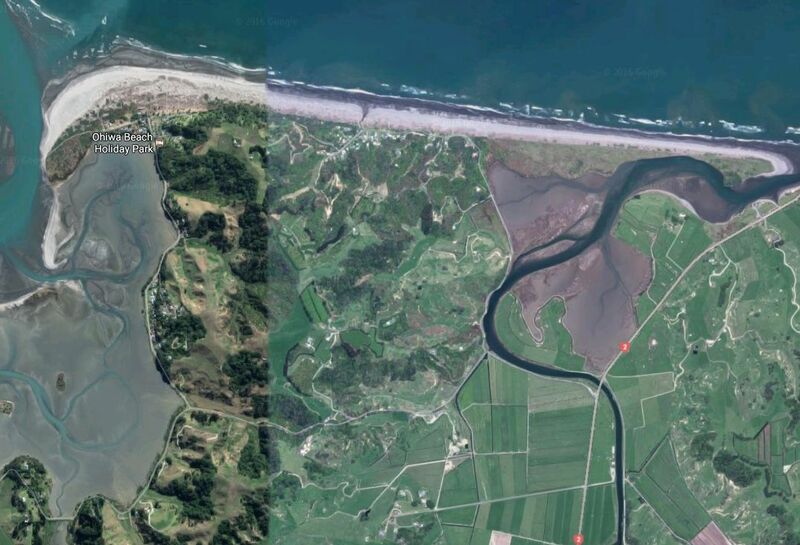 The regional park is in the upper left corner. 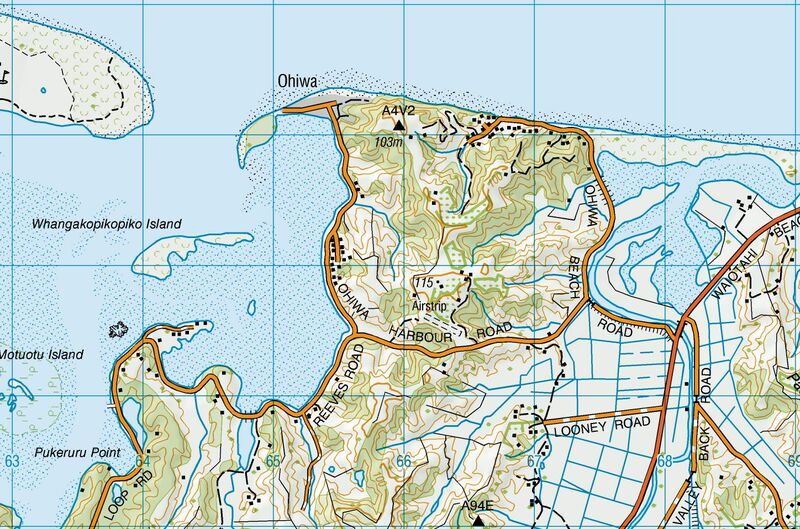 A topographic map excerpt showing about the same area as the aerial image. The tracks are not shown on this map.